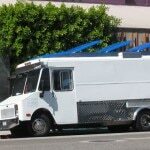 Food trucks, especially of the gourmet variety, have become a recent fixture on the gastronomic landscape of LA. 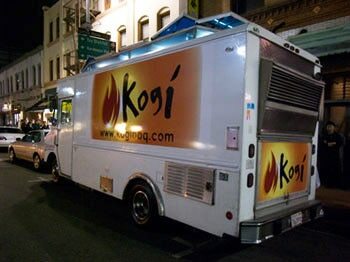 While neophyte hipsters may think that Kogi invented the taco truck, we can really trace it back to both Mexico and the Western “chuck wagons” that stretched from Texas to California in the 1860s. 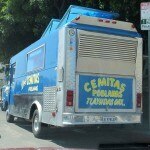 Thus, today’s ubiquitous “taco truck”—also known as a “lonchera”was born. As a blue-collar staple of construction sites the “roach coach” (or “maggot wagon”) gradually gained culinary cachet amongst a small handful of ethnic food critics. As cultural fusions began to spawn, they became a full-blown obsession for the new Twitter generation. 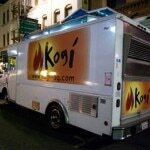 While a fleet of authentic Mexican trucks paved the way, recent LA history can look back to Roy Choi’s Kogi BBQ truck as the first “fusion” food truck, bursting onto the scene in 2008 with the force of a culinary rave party where foodies got high on Korean-Mexican short-rib tacos instead of hallucinogenic drugs. Two-hour lines were common, and today four Kogi trucks dash around the city; almost mind-bogglingly, Kogi has over 50,000 fans on Twitter. With the floodgates open, a gourmet food truck avalanche followed, with Indian (India Jones, Dosa), Vietnamese (Nom Nom, Phamished), and even Japanese-Peruvian fusion (Lomo Arigato) representing. Star chefs from upscale venues brought out sophisticated high-end trucks like Worldfare and the Border Grill truck. There are trucks for cupcakes, grass-fed sliders, hot dogs, and ice cream made with mascarpone and balsamic fig. If there’s a niche, most likely there’s a truck for it. Meanwhile, dozens of traditional Mexican taco trucks continue to dish up regional tacos and burritos to all walks of life in an array of neighborhoods, and perhaps they have even benefited from the recent popularity of the taco truck craze. Twitter and the i-Phone changed the paradigm of how, when and where we eat in a subtle but seismic way, allowing free advertising to stream to thousands of hungry fans, who then turned others on to their favorite truck in mere seconds. The election of Barack Obama and the triumph of the food truck culture across Los Angeles, if not America, are not unrelated as new media phenomena. There’s also perhaps the appeal of a new democratic way to dine, a call to spontaneity, the cachet of being part of a culinary cognoscenti that joins folks socially in a new and interesting way. Some love the stalking, the thrill of the chase. Others like the serendipity of finding their favorite truck as they drive by, or parked outside their office. And in these times of recession, the price is oh so right. Food trucks are also now popular for events from street fairs to private parties. We might call the movement a “food happening”—or maybe we’re just joining most of the rest of the world that has been enjoying street food from vendors, night markets and mobile carts for centuries. 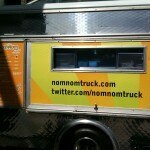 So to all mobile foodies, welcome to the future, as you are part of creating it. Enjoy our guide to gourmet food trucks, which includes our picks for LA’s top 10 food trucks, the top 10 food trucks in New York, San Francisco’s top 10 food trucks and the top 5 food trucks in the U.S. We’ll have more rolling out soon in different cities. Keep coming back to GAYOT.com for more Los Angeles Restaurant News, Restaurant Reviews, Culinary Events and LA Wine Dinners.